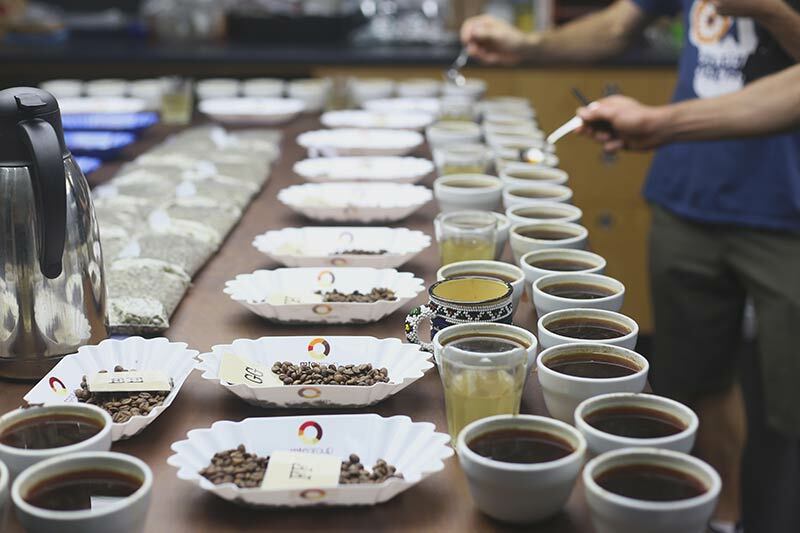 If you’ve joined us over the years at one of our many cupping events, you’ll no doubt have noted the intense slurping sound everyone was making as they’d move around the table from sample to sample. The sound your mum told you not to make, going on left, right and centre. Then you’d have got in on the act, as that’s how we ‘cup’ coffee. Although it can be startling to the newbie, the sound is the result of the cupper aspirating a small amount of coffee into the mouth to move it across their palate and all the way into the retronasal cavity. Flavour is the combination of taste and smell. At around 800 odour molecules coffee is over 70% smell. If you pinch your nose, you’ll find you can’t taste much at all, or differentiate flavours, in fact you can’t sense much beyond temperature and texture. Not very interesting at all! Since we would have a hard time snorting hot coffee up our nose everyday at work when cupping, as well as some ugly WHS issues, we’ve found the best way to have a proper retronasal exposure is to slurp. Some of us slurp louder than others, and that’s okay. Loud and proud! Believe it or not, spitting is part of it too. Not only does it keep us from ingesting more caffeine than we may want to, our sensitive retronasal olfactory sensors are still picking up valuable information upon expulsion of liquid from the mouth. Try it- if you swallow the coffee sample you get more information about its body and texture as the liquid moves across the tongue and down the throat, but by spitting the coffee you will be able to evaluate much more of the coffees unique flavour and aftertaste. We cup for a variety of reasons, to select coffees for purchase, to confirm arrivals and approve qualities, to monitor freshness, to develop and evaluate roast parameters, to discover new regions and varieties, and for fun, especially when Cup of Excellence season rolls around. Food scientists have identified 800 aromatic compounds in coffee, making it one of the most complex beverages out there. For example wine only contains about 200 aromatic compounds compared to 800 for coffee, or as we like to think- coffee lovers are 4x more complex than wine lovers! So come join us for a great flavour experience in one of our coffee cuppings. Slurping and spitting encouraged. Just don’t come wearing perfume or aftershave, as that can skew what cuppers are smelling. Now that’s etiquette you don’t hear every day!